NOW: This is the 14 room Italianate Victorian mansion where John Muir lived from 1890 to 1914; it is located in the city of Martinez. 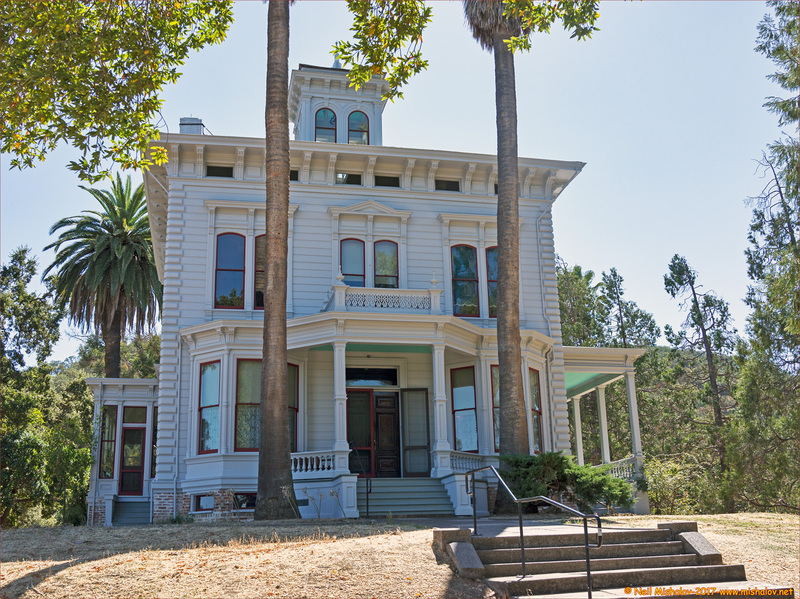 The mansion was built in 1883 by Dr. John T. Strentzel, John Muir's father-in-law. 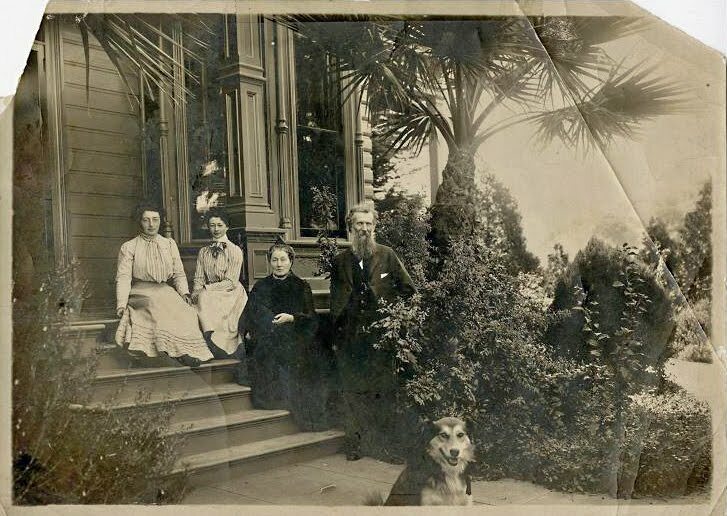 THEN: A portrait of John Muir's family taken in front of their home. Sitting on the porch of the house are the two daughters, Wanda Muir (1881-1942) and Helen Muir (1886-1964). Their parents, Louie Strentzel Muir (1847-1905) and John Muir (1838-1914) are standing on the front steps of the house. Sitkeen, the family dog, is in the photo. This picture was taken in 1901. 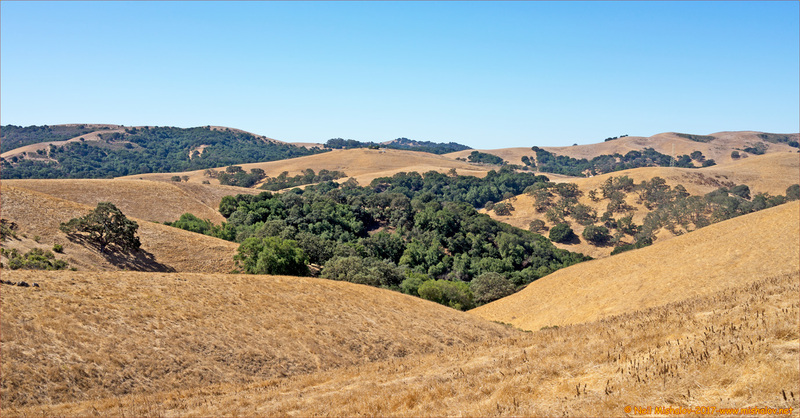 Image courtesy of John Muir National Historic Site. 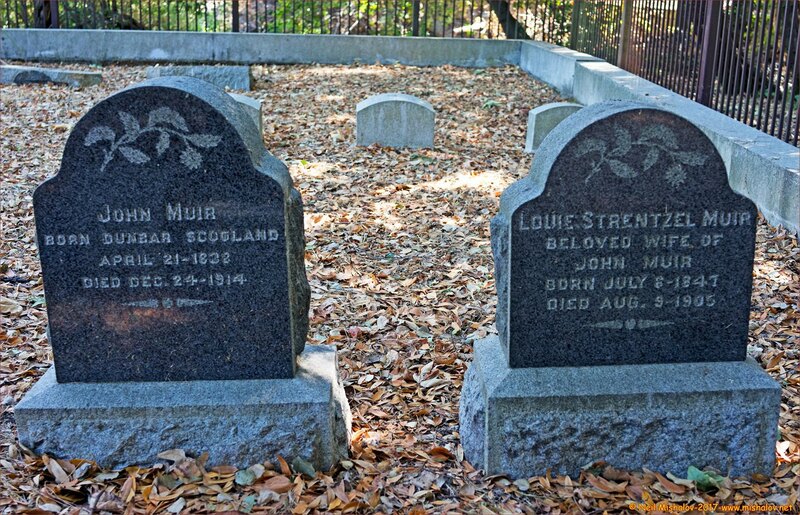 These are the gravesites of John Muir and his wife, Louie Strentzel Muir. 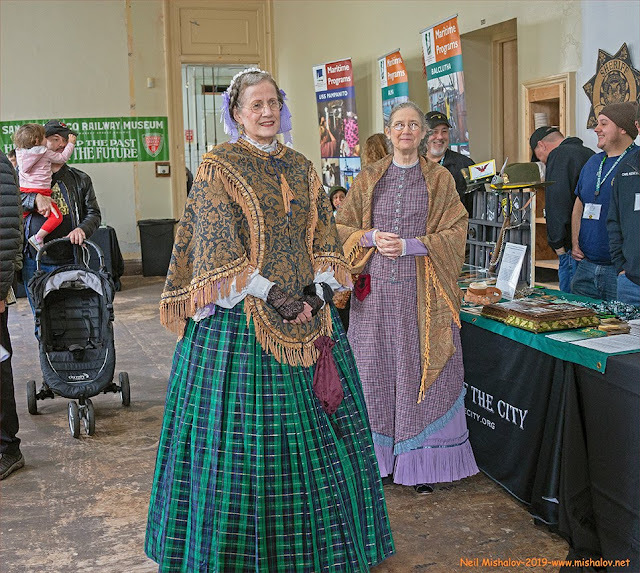 They are buried in a small cemetery known as the Muir-Strentzel Hanna Cemetery, whose size is approximately 30 feet by 40 feet. 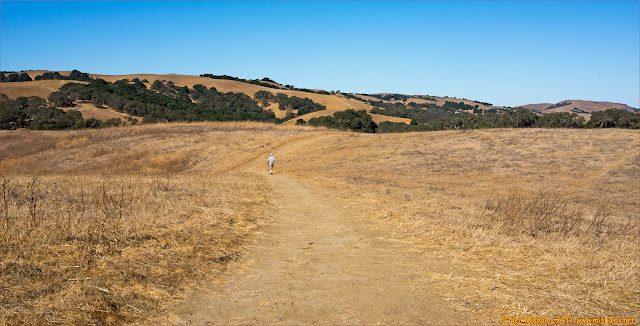 The 1.27-acre parcel of land on which the cemetery is sited was acquired from the Strentzel family in 2000 by the National Park Service. In addition to John Muir and his wife, his in-laws, Dr. John Theophil Strentzel (1813-1890) and his wife Louisiana Erwin Strentzel (1821-1897) are buried in the cemetery. 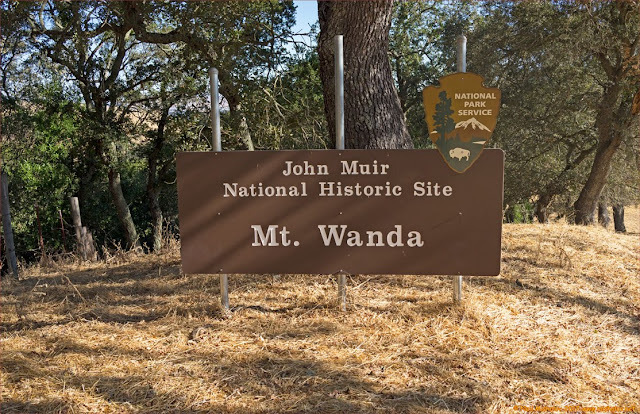 John Muir's daughter Wanda Muir Hanna and her husband, Thomas Hanna (1881-1947) are also buried in the cemetery. Helen Lillian Funk Muir, John Muir's youngest child, is buried in Bellevue Memorial Park, San Bernardino, California. This photograph was taken on 28 September 2017. The distance traveled was approximately 10.1 miles (16.2 kilometers). 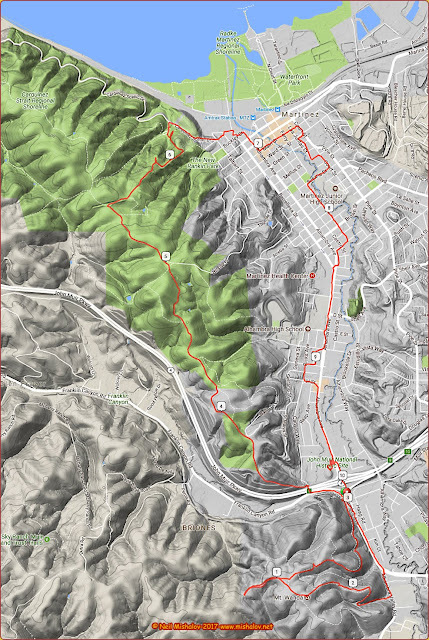 The cumulative elevation gain was about 1,398 feet (426 meters). Mile markers are displayed on the GPS generated track. Click on the image to see the full-size map. In 1988 Mount Wanda Nature Preserve was made a part of the John Muir National Historic Site. A view from the summit of Mount Wanda, 683 feet (208 meters). The hillock to the right of Mount Wanda is Mount Helen. The view is looking west. 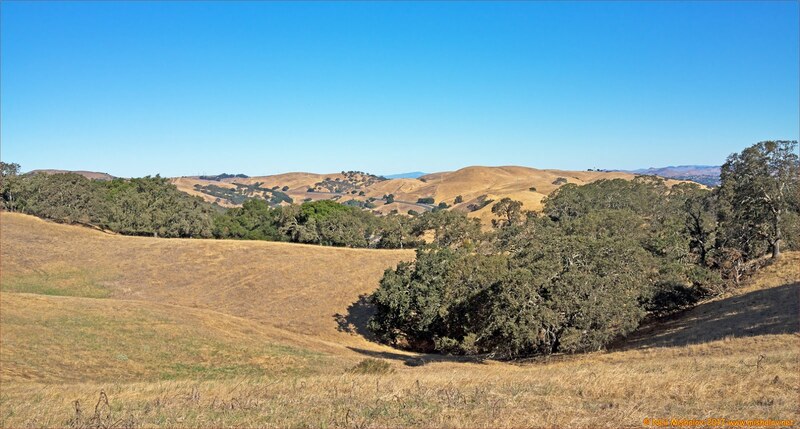 Mount Diablo is at an elevation of 3,848 feet (1,173 meters). Looking south from Mount Wanda. On the trail and looking north. Suisun Bay is visible in the distance. 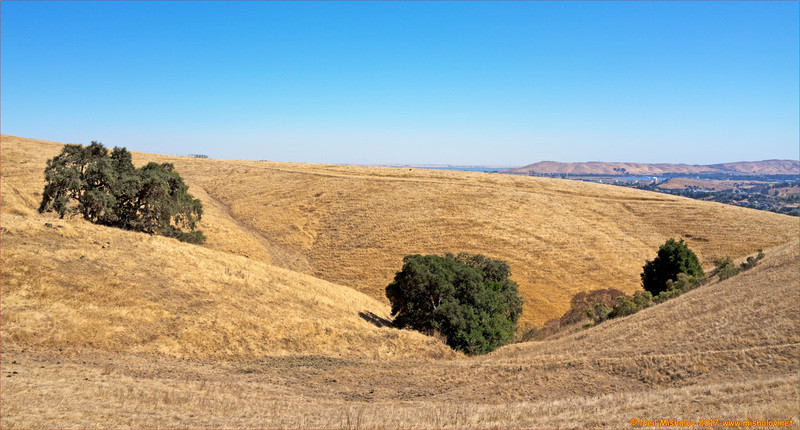 Looking west from the Hulet Hornbeck Trail in Carquinez Strait Regional Shoreline. 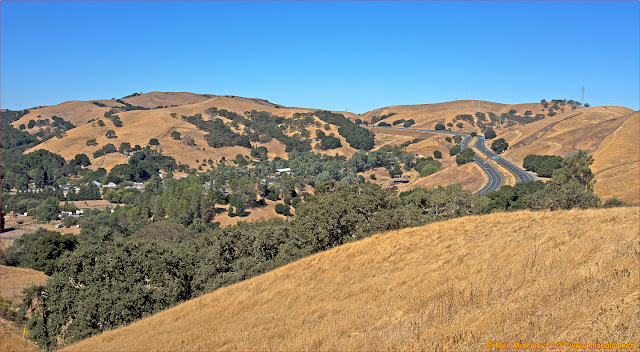 John Muir Parkway is visible. On the California Riding & Hiking Trail looking north. Downtown Martinez as seen from the Rankin Park Trail. 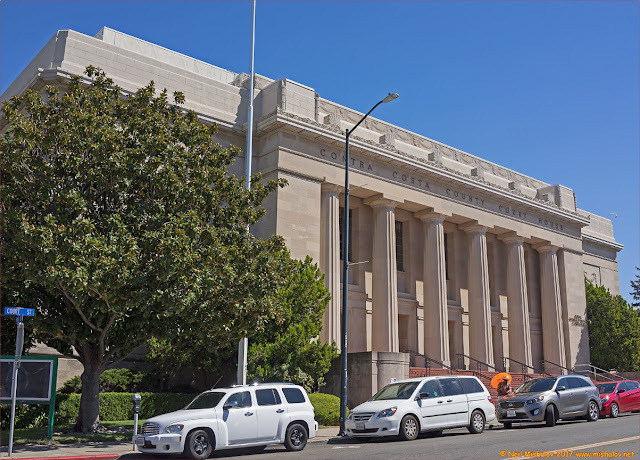 Contra Costa County Courthouse and the Shell Martinez Oil Refinery are visible. The view is looking east. The Benicia-Martinez Bridge is visible as is the site of the US Army's Benicia Arsenal, the city of Benicia and Suisun Bay. At one time, not too long ago, there was a fleet of as many as 340 old military ships anchored on the east side of the bridge. The fleet of ships was known as the "mothball fleet." If you look carefully, you will be able to see the one remaining military ship. The government has said that by the end of 2017 the mothball fleet will be history. Click Here for pictures of the now gone, but not forgotten, mothball fleet that was once anchored in Suisun Bay. This view is looking east. 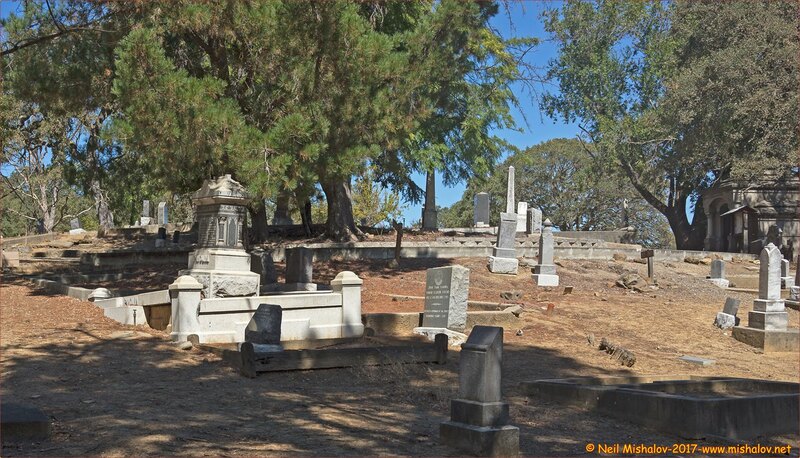 The Alhambra Pioneer Cemetery, Martinez. Contra Costa County Court House is located in Martinez, the county seat of Contra Costa County. This chart shows the elevation changes encountered during this ramble. Click on the image to see the full-size graph.